Nice enough effect but too situational to include in a deck unless you want it to stay as day, eg with San Marco. Under those circumstances it is good, though with San Marco potentially costing domains as well as this the Nexus feels like a must take. It's worth noting this only hits Night cards that were just played, which means it can't cancel a Plague Stone pop effect, unless I'm misunderstanding something. 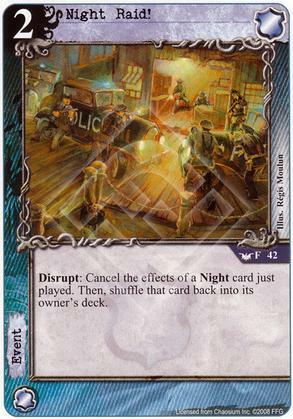 The problem with cards like this, though, is that they're almost entirely a meta call. If there are lots of Night cards in your meta, this is useful to throw in a deck. If not, it's pretty worthless. Basilica and beneath the burning Sun are solid picks in any agency build, rendering you immune to terror making sure you win combat and standing your characters. Agency also have a lot of cards enabled by day that protect your characters. When agency go for a full day build it can be really powerful, the one weakness is if someone plays a night card (especially the plague stone). This card takes an already powerful build and adds consistency.